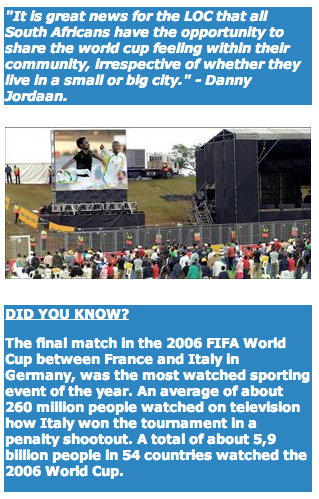 FIFA World Cup organisers are very happy with South Africa's preparations for the 2010 World Cup. The world soccer body and the 2010 Local Organising Committee (LOC) had an inspection tour to six of the ten 2010 World Cup stadiums recently. The group also looked at progress with other activities in the host cities like accommodation, finance, transport and the environment. They said they were pleased with what the cities had done so far. After the visits, FIFA's head of inspection Ron DelMont said: "We are very impressed with the efforts made in all venues visited and amazed by the level of detail of the preparations." The group visited Johannesburg's Ellis Park stadium, Loftus Versfeld in Pretoria, Rustenburg's Royal Bafokeng Sports Palace, Peter Mokaba in Polokwane, Mbombela in Nelspruit and the Mangaung Free State Stadium in Bloemfontein. They said the tour also showed them that preparations for the FIFA Confederations Cup 2009 was going well. They visited four of the FIFA Confederations Cup 2009 venues and said from what they saw, they were sure that the tournament would be a great success. Members of the inspection group were experts in different fields ranging from the technical side of the stadiums, to security, hospitality, media, marketing, TV and information technology. They carefully looked at the stadium plans and talked to project managers about the progress and changes that needed to be made. 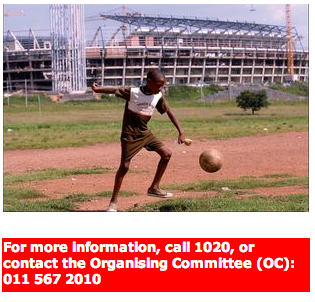 Due to some delays, Mbombela stadium was a few days behind the schedule. But the delegation said it was not a serious problem. They liked the unusual look of the stadium, which is an example of how modern design can be used to show off the province's rich wildlife. "It is very special and we can hardly wait to see the final touches. I am convinced it will leave a lasting impression with all spectators," DelMont said. FIFA and the LOC shared a lot of information during the visits, said LOC spokesperson, Tim Modise. "Our relationship with FIFA is growing from strength to strength," he said. The next inspection will be in October this year. Thanks to the 2010 FIFA Hospitality Programme, a lot of business will be given to small companies. This was announced at the start of the Hospitality Programme. The programme will handle services like tickets for suites at the stadiums, accommodation and transport. Local Organising Committee (LOC) CEO, Danny Jordaan, said small businesses would benefit as hospitality was not only about big things. 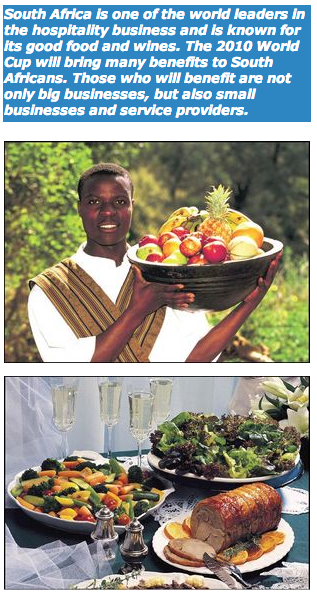 It is also about small things like tablecloths, flowers and other decorations for functions. He said all these services would be given to small businesses. The Hospitality Programme is run by MATCH. This is a company that offers services like issuing tickets, accommodation and catering to FIFA during the World Cups. 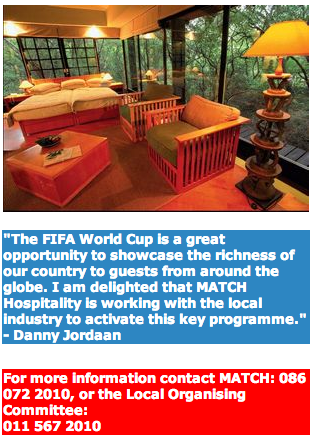 MATCH Hospitality is the only company worldwide that is allowed to sell special hospitality packages, including services and tickets for every match of the FIFA Confederations Cup 2009 and the 2010 World Cup. Two South African companies joined hands and were appointed as agents for the Hospitality Programme for both the FIFA Confederations Cup 2009 and the 2010 FIFA World Cup. The joint venture company is made up of two of South Africa's experienced sports marketing and hospitality groups, CIRCA Hospitality and Warwick Hospitality & Events. The LOC said they were very happy that two South African companies were working together to do this important job. MATCH Hospitality said they were pleased to have partners on board who had such long-standing and successful relationships in the area of football marketing. 120 000 tickets will be given away to allow poor people to attend the 2010 matches. The tickets will be paid for by World Cup sponsors. FIFA: FIFA is short for Fédération Internationale de Football Association, which is French for International Federation of Association Football. FIFA is the international managing body of Association Football. Its head office is in Zürich, Switzerland and Sepp Blatter is its president. CAF: Confederation of African Football. CAF manages international football in Africa. They organise soccer events like the Africa Cup of Nations, the CAF Confederations Cup and the African Champions League. SAFA: South African Football Association. SAFA manages football in South Africa and is a member of FIFA and of CAF. OC: Short for the 2010 FIFA World Cup Organising Committee SA. The committee brings together people from the South African Football Association (SAFA), the South African Government, labour and the business community to supervise the important job of organising this great event in our country. Host cities: These are the nine South African cities where the World Cup matches will be played. They are Johannesburg, Cape Town, Durban, Port Elizabeth, Nelspruit, Polokwane, Bloemfontein, Rustenburg and Pretoria. Johannesburg has two World Cup stadiums - Soccer City and Ellis Park. Host Cities Forum: A combined committee of government representatives and members of the OC. They supervise all aspects of the host cities' preparations and responsibilities. Fan parks: Public areas where people who don't have tickets for the stadiums can get together to watch matches on huge screens. Several official fan parks are planned in cities and towns all over South Africa. Every South African will be able to watch 2010 FIFA World Cup matches free of charge on SABC television at home or at places that offer public viewing. This will ensure that all football lovers will enjoy the special World Cup mood that will grip the whole world in 2010. The SABC, which is the official FIFA broadcasting partner, does not need to get a licence to broadcast the FIFA Confederations Cup in 2009 or the 2010 FIFA World Cup. Pubs, clubs, restaurants and bars will not have to apply for broadcasting licences as long as they do not charge admission fees or take part in sponsorship activities. FIFA said they hoped that with free access to public viewings, all fans in South Africa will be able to enjoy and be part of the "incredible FIFA World Cup experience." It would transform many communities into a hub of football passion during the Confederations Cup and the World Cup. The LOC plans to educate South Africans about their viewing rights. They said fans should keep in mind that public viewing areas like bars, clubs and restaurants will not be same as fan parks. The broadcast rights for public viewing areas will differ from that of fan parks. Anyone who wants to charge an admission fee to broadcast matches to the public will have to apply for a licence from FIFA. FIFA will donate all money made from such public viewing licences in South Africa to the 20 Football for Hope Centres across Africa. 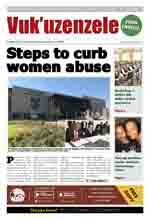 They aim to raise at least $10 million (US dollars) to build the centres.